The whisky gods have smiled on me once again this year with the arrival of the Diageo Special Release samples box that I put aside till the new year to properly taste them. (Each year I keep asking them to send full bottles and yet they turn a deaf ear to my humble request.) 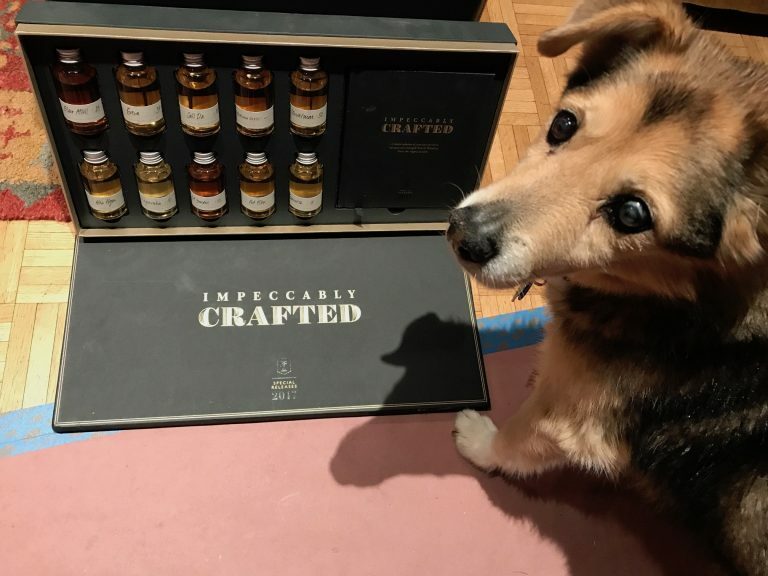 As my grandmother always said…”You can always ask…” Though as with every year the guarding of the samples were given to my beloved dog Garrett Oliver - the only one I trust with such an assignment. A brief history of the Diageo Special Release program which first started to release bottles with a small selection of the three bottles from Talisker and Port Ellen: The Special Releases are all limited edition small batch or single barrel releases of natural cask strength single malts in the 53-60% ABV range, not proofed to 40% ABV to sell more bottles. The range of releases are from distilleries well recognized to lesser known ones to those closed during the whisky depression of the ‘80s and early ‘90s. The number of bottles per release worldwide range from a few hundred to a couple of thousand which make some of the limited editions immediately valuable and a worthy addition to your “Liquor 401K” plan. The bottles are sold through whisky specialty retailers and the more expensive bottlings rarely make it on the shelf unless behind the fancy display case to ooooh and aaahhh over. This comes from a distillery whose bottles I rarely see and I never tasted before. It comes from the original distiller’s stock and is also the first new release of this distillery since 2003. The distillery is located in Pitlochry, Pertshire and originally opened in 1798. As with most distilleries, it has had multiple owners and currently has four stills, as well as having opened one of the first Visitor Centers in Scotland in 1987. This release yielded 5514 bottles worldwide. The color is a deep amber which reflects its maturity in ex-bodega European oak butts for 23 years. The nose was sweeter to me than initially expected with caramel and bananas on the first inhale followed by a subtle minty spice. It has a medium to heavy body as you feel the weight of its time in the cask. The taste retained a fruity nature to match the first inhale, followed by a warming spice. Upon adding a few droplets of water, the nose become more subtle in a deeper, layered way, and the taste overall become sweeter in the mouth. The finish is medium spiced, without overcoating the throat. Overall, a whisky that can be enjoyed after a flavorful dessert, or on its own. Brora first began in 1819 as Clynelish Distillery in the Coastal Highlands. As with most distilleries, it had periods when it was closed at times before and during WWII. When the new Clynelish Distillery opened up in 1967, this distillery again went through multiple closings, but was reopened in 1969 to produce a Islay-style malt for blending during a shortage. It was closed again in 1983 and its whiskies have been in numerous Special Releases bottlings over the years. This 34 Year release is only 3000 bottles worldwide. The good news, as we reported here in November, is Diageo has plans to re-open the distillery again as a single malt producer in the near future. The color is a deep gold that came from its 34 years in refill American oak hogshead casks. The nose brings the fragrances of the sea to you – seaweed with a light scent of sweetness. The body for me is not as solid, nor are its legs, for a 34 year old whisky. The first hit on the tongue matches the Brora distillery profile of waxy, along with the peppery zing. With a drop of water more peppery spice lays on the tongue that continues to the finish with a touch of dark fruit just layering above. I have to admit I genuinely love the whiskies from the distillery, as well as the distillery itself. I have visited this Islay distillery a few times and enjoyed the amazing views from its windows. My favorite taxi driver of all time, Freddie Bell, who drives for Islay Taxis, worked at this distillery for over 30 years. He even bought his house from the distillery – one that overlooks the distillery, of course. The whisky comes from a batch made once a year from unpeated malt for blending in the “Highland Style” and not their usual “Islay Profile Whisky”. This release is the oldest of the Unpeated Style selections. The refill American oak hogshead casks give slight yellow coloring. Though it is an Islay distillery release I am hard pressed to find the peat here, and instead get a crisp lemon nose rounded out with soft herbs. The body has weight to it - more than I expected for an 18 year. The lemon theme continues in the mouth with a light mix of maritime air, and soft sweetness that comes later and with water. It has a nice finish that is measured without being overwhelming, and long. Overall this is the best value of the releases. Note: no year of distillation is declared on the bottle. This is an interesting one for it is a natural cask strength blended whisky that comes from 28 active operating single malt distilleries owned by Diageo, hence the name. There is no age statement. The color is a light amber. The nose offers no detectable Islay notes, more from the Lowlands and Speyside. A fine mix of sweet and slight spice. The body is full and does not break apart with water. The light sweetness continues when in the mouth and dark chocolate becomes more apparent as it lingers. The finish is longer than most blends, yet would be better described for its medium finish with a soft, lingering end. An interesting approach and something worthy to offer to those who scoff at blends. Convalmore was based outside Dufftown in Speyside and started production in 1894. By taking advantage of nearby good railway links, the whisky supplied many Glasgow merchants and was acquired by James Buchanan in 1906. The distillery had a brief closure during the War and was finally closed in 1985 during the Whisky Shutdown. The whisky has a deep, gold finish. Fitting its Speyside heritage, the tart fruit with an edge of dark sweetness is found on the nose. It has a medium body and hugs the glass as it moves around, befitting a 34 year old Scotch. The tartness continues when in the mouth, and with a drop of water, the floral notes begin to fill the mouth. It has a long, warming finish with its cask strength fullness. Glen Elgin, from heart of Speyside, was founded in 1899. It was the last distillery built in Speyside for almost 60 years, and it is still an active distillery operating today. Glen Elgin's main production is geared towards White Horse blended Scotch. Their 12 year single malts can be found in certain countries. The color is a light gold, owing to maturation in ex-bodega and refill European oak butts. Speyside is here with its fresh fruit nose and rounded floral tones. The whisky keeps it fruitiness and splashes of honey on the tongue. A drop of water brings in a fuller fruitiness, and with it, the initial spice is muted. It has nice legs for an 18 year, with a finish that is longer than expected, with some oakiness rounding it out. Lagavulin was legally founded in 1816, but may have been operational before the tax collectors came looking for it on Islay. Today, the distillery is run by Georgie Crawford. The famed whisky writer Alfred Barnard referred to its 8 year old in the late 1880’s as “exceptionally fine” as it continues to hold that distinction today, made from its pear shaped pot stills. The whisky was held in refill American oak hogshead, which gives its pale gold color and matches the color for its age. The smoke is there in the beginning and the feel of the island fills your nostrils with hints of black pepper when you dig deep. The licorice begins to build as its characteristically oily base lands in your mouth. With water, the crisp fruitiness begins to emerge under the smoke shadow. The Islay smoke is part of the medium finish along with an edge of spice. It was one of the oldest grain distilleries in Scotland established in the early 1800s and closed in 2009. It sat alongside a canal close to the heart of Glasgow. This whisky is the oldest ever Special Release with only 752 bottles released worldwide. 52 Years in refill American hogshead casks gives it its rose gold coloring. It is a single grain whisky, with butterscotch and the expected bananas and other fruits adding to the medley on the nose. The fruit is there in the mouth as is the appearance of honey, and the longer its stays, a spice starts to emerge. The legs are strong enough at the end, with a long and warming finish that is surprisingly not overpowering at the ABV, and not too oaky for being this long in the cask. So begins my yearly rant where the person who decided to close this distillery should be quartered and then fed to the hogs, along with the person who cancelled the epic TV Series Deadwood. The distillery was located on the south coast and established in 1825 and was finally closed in 1983. The name was kept alive through its maltings and special releases and now the whisky gods smile on us again with the recent announcement that the distillery will reopen in 2020. It is a 37 year Port Ellen in refill American oak hogsheads and butts which give it a deep, rich, gold color. Port Ellen’s nose to me is that orchestra of smoke and flowers, with hints of citrus as it waffs up. The citrus continues in the mouth, with dollops of smoked meat and spices. The body matches your expectations for a 37 year old whisky, and the finish is long and smooth with the right amount of smoke, which lasts longer with water added. Teaninich is a distillery found in the Highlands by Alness, a coastal town also known for housing Dalmore distillery, as well as a rich history of winning regional flower competitions. Teaninich was founded in 1817 and closed during the War. The distillery currently uses a mash filter press, as compared to the mash tuns most other Scotch distilleries still use today. This is a first release of Teaninich whisky in the Special Releases as it celebrates its 200 year anniversary. Most of Teaninich whisky is found in blends of Johnnie Walker including Red Label. It is a 17 year whisky matured in refill American oak hogsheads and ASBs that was filled in 1999. It has a nice, deep amber color. This Highland whisky has a filler of smoke in the background of the nose, with oak and citrus up front. The light citrus continues on the palate with hints of spice. When water is added, the subtle sweetness begins to appear along with pear. The body is smooth, and the finish is semi-long, with hints of spice and sweetness that ends softly at the right note.